If you're expecting a child, here's a word of caution about what happens all-too-frequently for a dad-to-be: Shortly after his newborn's birth, he holds his baby feeling totally amazed, quite overwhelmed and thinking to himself, Gee, you're so small; I'm afraid I might hurt you. Coupled with this, men commonly feel uncertain about their skills to care for a young one. This lack of knowing how to be a father can have huge unintended negative consequences that ripple through the family. If it feels like you don't instinctively know how to care for your baby, that's normal-for new dads and mums. Every new parent has to learn, just like your child has a lot to learn about life. What's different for your baby and his / her mother is that they don't really have a choice about taking on their new role-they both have a biological imperative. You do have a choice, and if you're reading this, then you have probably already decided that you want to take an active role in your child's life. That's a great first step! And although no expecting father is completely ready for what he's about to experience, you can be ready to hold your newborn feeling more confident about your new role. These fatherhood qualities influence how you interact with your child, how you respond to and treat the mother of your child, and how you care for yourself. With those in mind, here are some more specific suggestions. In modern societies, pregnancy is usually focused almost entirely on the woman, and men often feel left out. Today being pregnant or giving birth is no longer "women's business." Most women want their husband or partner to be with them during the birthing process. Couple this with changes to work roles and the increase in the numbers of at-home dads and single dads, and it's clear that a father needs to have a full compliment of skills. To a child, a father is just as important as his mother. You can and should be a vital part of the whole process. Watch and talk to other fathers. Begin to notice how other men use (or don't use) the above qualities with their children. Mimic what you like and try to avoid doing what you don't like. Don't be afraid to talk to other fathers; they understand what you're feeling. Tell the woman in your life that you need her to nurture you. A woman's body encounters radical changes during pregnancy, and she has absolutely no control over them. It's easy to see how your partner might become quite preoccupied with her own adjustments and forget about what you're experiencing-even if this is your sixth child. Talk about that and feel free to ask for some care and attention too. You are both going to be parents, so you need to nurture each other. As you go through the months of pregnancy and make adjustments, be intentional about capturing memories and celebrating milestones along the way as you take on this new responsibility. That could mean keeping a journal or blog, going through a ceremony related to your faith, or creating your own unique ritual to acknowledge that you're developing qualities that will help you become a great father. Also, remember to notice and appreciate even the smallest things; give thanks for them! When times are tough as a dad, you learn quickly to be grateful for the little joys along the way. This is probably the most important suggestion because it's an attitude that influences all your other actions and your commitment to be a father. Don't feel bad if you didn't know you needed to grow during pregnancy in the areas I listed above. Now that you do know, please start thinking about and developing those qualities now. The earlier you can begin the growth process, the sooner you, your baby, and his mother will all see the benefits. Phase 1: from the time pregnancy is acknowledged continuing through the first 12 weeks. Often the pregnant woman feels unwell, tired and irritable, and you are just getting used to the idea that you'll be a father. This phase initiates your personal growth cycle. Phase 2: 12 weeks to 24 weeks. Now the woman begins to feel better and the pregnancy becomes obvious to everyone else. Women no longer just feel fat; they feel pregnant. You may feel pride at the thought that you will soon be a daddy. Join that pride to growing your fatherhood qualities and you're well on your way to being a great dad and partner. Phase 3: 24 weeks until you attend childbirth classes. Now you can feel your baby kick, and actually being a father doesn't seem so far away. In fact, the birth becomes a target on the calendar. 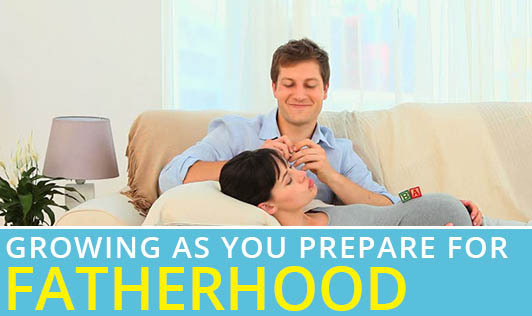 During this phase you want to begin to prepare for the birth. Also continue to increase your awareness of how other mothers and fathers interact with their children during different ages. Phase 4: 32 weeks to the birth. The woman begins to feel a lot of physical discomfort again as her body gets ready for the extraordinary event that is about to happen. Hopefully both of you are learning good birth and coaching skills so you can work with your baby's efforts to be born on the big day. Phase 5: the birth itself. This life-changing occasion propels you out of becoming a dad to being one. This one event is one of life's transitional gateways just as puberty, marriage or death. There's nothing quite like it! Enjoy every mument. Your baby and its mother have no choice about their growth. Simply being around a pregnant woman highlights that reality for you. Men have stood on the edge of pregnancy and childbirth for generations, and now that times have changed, you need to change. The first change you can make is to choose to start growing the positive fatherhood qualities that you'll need for many years to come. You do what you know how to do, and when you know better, you do better. So now you know you must grow during pregnancy to keep up with the growth occurring in your baby and its mother. You'll never regret this choice. Lighten your heart! Learn to giggle, to laugh for no reason, to enjoy stupid muments without feeling stupid or putting others down, and to exercise delight even in the most mundane tasks. Now, picture yourself sitting in a chair, holding your newborn, having chosen to grow positive fathering qualities during pregnancy and then worked with your baby's efforts to be born. That's a different picture entirely, don't you agree?